Well, what if you happen to like a bit of bitterness? I’d love to host a cooking show and say, “Don’t be afraid to include some of the white pith for a little acerbic note in this dish.” And then we could watch TV chefs across the nation as they run screaming in horror through the streets. Well, I can’t be a TV chef but I can pass along this recipe for one of my favorite pies that happens to use whole lemons -- including the white pith that is held in such disdain these days. Shaker Lemon Pie epitomizes the frugality of the early Shakers. I can just picture Eldress Prudence Stickney as she lamented the wastefulness of throwing all those lovely lemon rinds away. So, she creatively employed years of Shaker resourcefulness (Shaker motto: Hands to Work; Hearts to God) and came up with this delicious pie. This treat is definitely not for the faint of heart. If you enjoy the pucker of lemons, then it’s for you. The filling is sort of a cross between lemon curd and lemon marmalade. Also, it’s really easy to make. I gave this recipe to my Aunt Jo and it became one of her husband’s favorites. Well, until she recently divorced him. Now he gets no more pie. Thoroughly wash lemons, then dry with paper towel. Slice the lemons as thinly as possible; remove and discard seeds. Add slices to a bowl and toss with sugar and salt. Cover and set aside at room temperature for 24 hours. Preheat the oven to 425F. Roll out half the dough 1/8 inch thick on a lightly floured surface, fit it into a 9-inch (1-quart) pie plate, and trim the edge, leaving a 1/2-inch overhang. Roll out the remaining dough into a 12-inch round on a lightly floured surface, drape it over the filling, and trim it, leaving a 1-inch overhang. Fold the overhang under the bottom crust, pressing the edge to seal it, and crimp the edge decoratively. Beat one egg white until frothy and brush over pie crust, then sprinkle with coarse sugar. Cut slits in the crust with a sharp knife, forming steam vents, and bake the pie in the middle of the oven for 25 minutes. 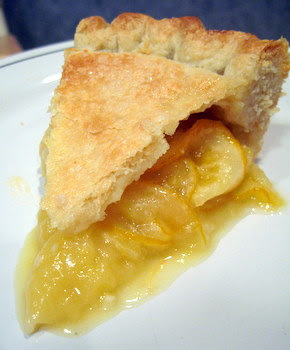 Reduce the temperature to 350F and bake the pie for 20 to 25 minutes more, or until the crust is golden. Let the pie cool on a rack and serve it warm at room temperature. I’ve mentioned this before, but I really enjoy watching cooking shows. A lot. I watch them the way some guys watch football games. So, here is my review of some of the more popular cooking shows that are on these days. This is a new favorite of mine. Watching her deft and quick movements, you can tell that this woman has spent a lot of time in professional kitchens and has paid her dues. She also does this cute growly voice that’s pretty entertaining. It’s also really amazing to see the incredible amount of salt she uses. Apparently, that’s her secret. That guy is just way too arrogant and full of himself. They test a recipe dozens of times to find the absolute best way to prepare it. I’ve learned a lot from this show. Their marinara sauce is to die for. But sometimes they go over the top with preparation methods. Like I’m ever going to make an entire charcoal fire just to grill a fish fillet for two minutes. Rub a lamp. Thirty minutes of slop-and-glop. And shamelessly promoting her goofy orange cookware. It’s all about the cleavage with this woman. That’s fine if you’re into that sort of thing but her dainty moves make it all too apparent that she really hasn’t spent much time getting greasy in a kitchen. What’s not to like about Paula? The woman also keeps it “real” by shamelessly using everyday ingredients that normal folks really use. Canned mushroom soup and mayonnaise often make their appearances. I’m waiting for her to make duck al orange using Tang Instant Breakfast Drink. And is her son, Bobby, like, EVER going to come out of the closet? He’s a little hyper-active but the boy can definitely slam some tasty food. I want to make everything he does. Wow. What more can I say about my Nigella? She says up front that she’s not a cook but, oh my goodness, all her recipes are sooooo tasty appealing. The only cookbooks I own are hers and Julia Child’s. What more would anyone need? The homeless man walks away. Okay, that passenger was me. 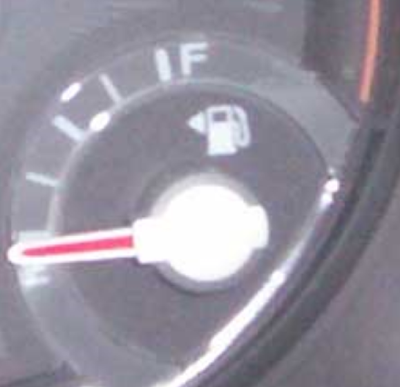 Have you ever been in a rental car (or one that's not your own), pulled into a gas station and then realized that you didn't know which side of the car the fuel door was located? I rent cars all the time and I always seem to be driving up to the wrong side of the gas pump. Well, no more! Not since I learned this handy dandy secret. See the arrow pointing to the left? That means the fuel door is on the left side of the car; the driver's side. This little bit of knowledge has just rocked my world . . . I was messing around with the French horn yesterday. Pretty good for an old guy, eh? My favorite TV program is, hands down, The Office. 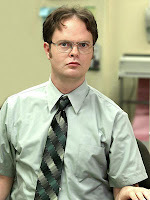 I think I relate to it because I see parts of myself that I don’t like in characters such as Dwight and Michael. And I did away with that hairstyle. I realized that I have 30 years of experience working in offices. Well, minus that three-year escapade into restaurant management when I was young and foolish. Oh, and there that seven-year escapade into the monastery when I was a little older and still not very wise. So, basically, that comes to 20 years of office experience that I’ve under my belt. 1. When the boss says it’s ‘crunch time’, continue to work as normal but just walk really fast down the corridors and hallways. Okay, that’s about all the advice I have for now. I’m bizzy and have lots of work to do. I just found out yesterday that I can have a cat in my new apartment if I so choose. I love both cats and dogs but I’m just not sure that I want to put up with feline maintenance and all that entails. 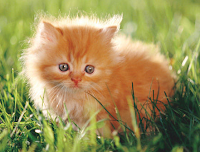 If I could procure a cat that was guaranteed not to shed, not to throw up on the carpet or furniture, and would keep its litter box impeccably tidy, then sure, I’d get a cat. My sofa is solid navy blue and also solid fabric - - a kitty cat would turn that into a giant scratching post the moment I’d turn my back. Then the naughty kitty cat would get hurled off a 50th story balcony and I would get in trouble. I know that if Miss Healthypants drags me to the shelter, I’ll be walking out with a damn cat. It’s been about six weeks since I decided to try “converting” to the Dvorak keyboard and I thought I’d give you an update. I just know you’ve all been waiting on pins and needles, ever so anxious to know how it’s been going. For those of you who don’t leap on my blog every day breathlessly devouring every word I write, I’ll tell you a little bit about this Dvorak thing of which I speak. It’s a different keyboard layout that is much more efficient to type on. Your fingers actually travel 80 percent less using Dvorak because of the way it’s laid out. I decide to learn this keyboard and I will admit that it’s been a very interesting experience so far. I had read all these reports claiming that Dvorak was so incredibly easy to learn and that you’d soon be blazing away faster than you had ever typed before. Even though I've been practicing about two hours a day, that wasn’t happening with me and I finally figured out why. I’ve probably been typing a lot longer than any of the people who wrote these claims. Also, they probably learned “keyboarding” rather than typing. Additionally, I doubt than any of them had ever been bona fide typists in the classical sense. I learned actual typing on an old-fashioned manual typewriter where you really had to bang some letters. Perhaps that had “engrained” the qwerty layout much more deeply into the recesses of the old gray matter. At any rate, it has really been a challenge but one that I’ve really enjoyed taking on. I can now touch-type at a blinding 30 wpm using Dvorak. What’s really interesting is that I’ve lost the ability to type in qwerty. I feel like I'm in limbo; an astronaut on the dark side of the moon. I thought about giving it all up until I read an essay from a woman who could type at 100+ wpm on qwerty and made the change. She said that after two months she could type at 50 wpm and had regained her speed back after three months. I’m pretty much on track. So, why am I spending so much time and energy learning this? OOOooo! I’m so glad you asked! 1. It’s similar to learning another language, only this one involves finger-action. For me, that’s like playing the piano. 2. I love the way it feels to type on the Dvorak keyboard. Take a look at it again. Now imagine your index fingers on the ‘u’ and he ‘h’ and type the word “months” and “these”. Isn’t that the most incredible thing EVER??? 3. Typing on a Dvorak keyboard is different from the norm. The normative of anything has never been appealing to me. 4. I’d like to eventually get my speed well above 100 wpm which is pretty impossible to do on qwerty. However, the Guinness world record is held by Barbara Blackburn at 212 wpm which she was able to do using a Dvorak keyboard. Frankly, I’d love a job as a transcriptionist. Maybe if I become really proficient at Dvorak, I can get a part time job doing just that and working from home. Sigh . . . we all have dreams. Mine just happen to be excruciatingly nerdy. Ah! There's nothing quite like Springtime here in the southern part of the northeastern Midwest. 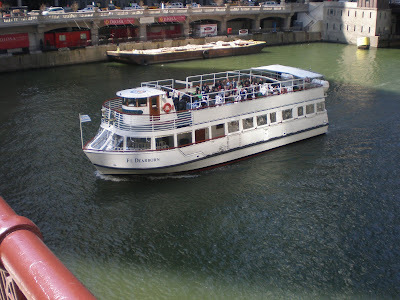 Tourist boats are a-floating . 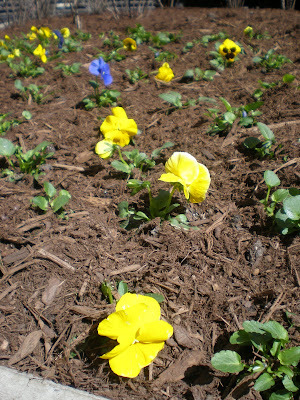 . .
Pansies are a-blooming . 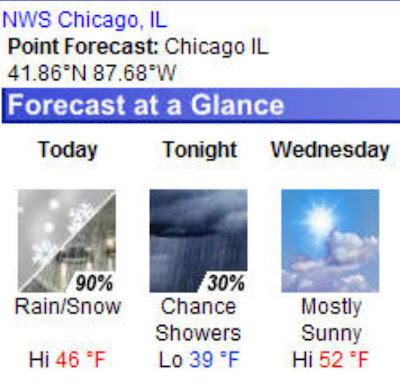 . .
And there's a ninety percent chance of snow today. 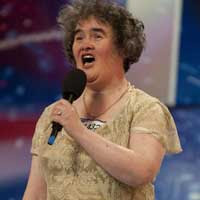 I will be the first to admit that I love love LOVE Susan Boyle and everything she represents. I'll freely admit that I instantly got teary-eyed when she sang on Larry King last night. 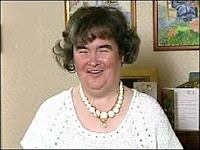 GLASGOW - Within days of becoming a worldwide sensation, Scottish singing contestant, Susan Boyle, appears to be embracing the life of a celebrity by emulating the notorious activities of Hollywood’s most famous. While exiting a limousine to appear on Larry King Live, many spectators in the crowd were shocked by Boyle’s new look. Although the singer was still sporting the same dress she wore as a contestant, it soon became obvious that Hollywood had made a dramatic influence on her appearance. Upon returning to her native Scotland, the famous crooner was soon pulled over by police near a Glasgow nightclub for driving without a license. Upon leaving the police station, Boyle immediately sought out the nearest salon and demanded to have her head shaved. Meanwhile, a travel agency near Boyle’s home town of Blackburn reports that several airline tickets to Malawi and Namibia have recently been purchased by the singer. Ness sighed and pensively gazed out the window for a moment. In other news, online retailers of costume eyebrows and wigs are reporting record sales due to thousands of drag queens frantically rushing to incorporate Boyle into their acts. 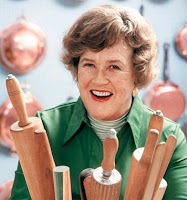 Has anyone else noticed the resemblance between the Youtube sensation, Susan Boyle, and Julia Child? I wonder if Ms. Boyle is the secret offspring of the Queen of the Kitchen? 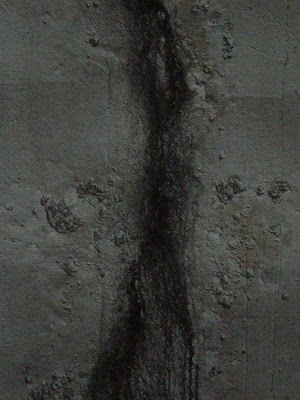 I was in the subway this morning and noticed a strange image in the fetid sludge dripping down the subway wall. It looked like the image of the Virgin Mary! No? Okay, here's a close-up. I’ll bet if I publicize this, there would be lots of those Virgin Mary apparition folks lighting candles, saying rosaries, and praying for her diving intercession in the Division Street subway on the Blue Line. That is, until they were hit by an oncoming train. I got so tired of hearing nothing but coverage of Captain Phillips and the Somali pirates all weekend. Yes, I’m certainly glad that he and his crew escaped unharmed, but the news coverage was just way too extensive. 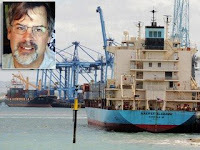 Cheers erupted around the world today over the successful rescue of Captain Richard Phillips by navy SEALS after a five-day standoff with Somali pirates. Meanwhile, residents of Phillips’ home town of Underhill, Vermont were elated over the Easter Sunday ‘miracle’ and have planned an honorary week-long celebration upon his return. “We could not have asked for a more successful outcome,” said Maersk Shipping Line president, John Reinhart. The Norfolk-based company has subsequently requested a 27 billion dollar bailout from the federal government in order to avoid bankruptcy. Captain Phillips could not be reached for comment. One of the things I’ve always wondered about was what Jesus’ last words on the cross actually were. It seems to be different in all four of the gospels. For those who demand that the Bible be taken literally, it takes some pretty good exegetical acrobatics to get around this one. Here’s how I imagine it all went down on that Friday afternoon in 33 a.d.
Matthew: (looking up at the cross) What’s he saying? Did he say something? Luke: I don’t know. Nothing yet. John: It’s been three hours now. I’m hungry. Mark: All I’ve got are these marshmallow peeps. Luke: Wow! Those are great last words! I’m gonna write that down. Mark: Now what am I gonna write in my gospel? Luke: I dunno. I got dibs on that ‘into your hands’ bit. I called it. Matthew: Hey wait. I don’t think he’s finished. John: What? What was that? Mary: It’s Aramaic, you fool! Mark: Excellent. I got dibs! Matthew: My Jewish congregation would really relate to that one. Mark, you keep it in Aramaic. I’m gonna write it down in Greek. John: Is that it? What about me? Matthew: Hey. What’s that bunny doing here? That’s the second time I’ve seen it hopping around. Luke: Beats me. Hey, where’d all those colored eggs come from? Mark: Wait! He’s about to say something? John: That’s all I get for my gospel? That’s it? Matthew: I’m afraid that’s it, dude. Mark: Ssshhh! He’s about to say some more! Thomas: Cool! That’s going down in my gospel. Matthew: Yeah, good luck with that one, Tom. Luke: Listen guys, I've got to get to choir practice. For some reason, we're doing the Hallelujah chorus on Sunday morning. I'm already sick of that piece. Mark: Fine. Let’s go hunt some of these colored eggs. They seem to be hidden everywhere . . . Okay, we made a video of Miss Healthypants playing her trombone. Now here's a video of moi playing the French horn. I’m almost sad that Lent is coming to an end. I know we’re supposed to practice self-denial during Lent. So, this year I decided to give up ‘delayed gratification’ during these forty days. That may sound funny to you, but I have to say that it’s been the most productive, insightful Lent I’ve ever experienced. I didn’t realize how tentative I was about most endeavors. Maybe that’s due to being *ahem* middle-aged or slowing down or perhaps a general lack of enthusiasm about anything in general. But making a conscious effort to “just do it” for forty days has really been a period of growth for me. I’ve realized how most of my tentativeness stems from plain ‘ol fear. That’s hardly a way to live one’s life. And let’s face it – we only get one crack at this chance to be on an earthly stage. The things I’ve found most gratifying are the things I’ve really worked for. Conversely, my biggest regrets in life were over things I failed to accomplish. And why didn’t I undertake those endeavors? Fear of criticism, of not being able to achieve it, of finding the necessary steps unpleasant, of what others may think, fear of the future, maybe even fear of success, but the list goes on, ad nauseum. A certain Nazarene two thousand years ago certainly knew the brevity of our time on earth. Whether or not he actually experienced a resurrection, I really don’t know. The fact that he (God) experienced an earthly life and death just like we do has always been enough for me. But he seemed to make the most of it while he was here. Maybe I can do just a little bit of that too. Giving up 'delayed gratification' for Lent may sound funny; I doubt many senior church officials would sanction it . . . but it works for me. Awhile back, I learned that Miss Healthypants played the trombone during high school and college. As a matter of fact, she was a pretty talented trombonist. Very talented in fact. I saw evidence of this when she and Iwanski played an old video of her when she was in a jazz band in college. When it came time for her solo, she stood up in her cute little tuxedo and just belted out this incredibly intricate solo. The girl definitely had some chops. I wanted to hear her play again, but alas, she had no trombone. So, recently I found a place that rents out band instruments and I procured a trombone for Miss Tromboneypants. (I also got a French horn for myself since that’s what I played when I was a band geek). I surprised her with it this past weekend which you can read about here on her blog. The girl has definitely got some chops. Here’s a video of her playing it. Okay, back to me and the French horn. Back when I began the 6th grade, I was so incredibly excited over getting to play the French horn. The first couple of weeks, we learned how to take care of our instruments and weren’t allowed to take them home just yet. But I remember, oh so well, that first day we could take our band instruments home to practice. Oh my goodness, I was one proud little dork walking home with that French horn case. Lots of my friends got to play football for the first time and were proud to don all those football pads. But while walking home that day, I just knew that everyone could plainly see that I was, indeed, a bona fide French horn player. I practically floated home that day. Last week when I was picking up the trombone and my own French horn from the rental shop, there was a little band geek and his mom in the shop as well. He had glasses and looked to be in 6th grade or maybe going to start 6th grade. I have to say, that after I paid for the rentals it felt really good to be walking down the street with a French horn once again. It’s been 32 years since I’ve played one. But as I was walking down that street last week, I was twelve years old all over again. I don't think winter is ever going to end. Ice is still perilous . . .
Tulips are pushing their way up through the snow . . . I took this little photo as I was leaving work this afternoon. ‘Twas another night of wonderful food at Lao Sze Chuan last night. 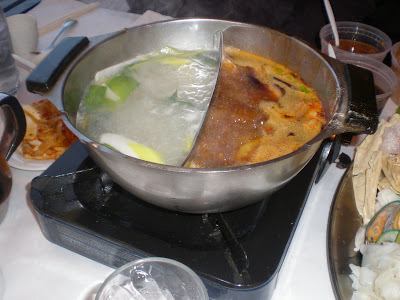 This time, we tried something different and ordered the Hot Pot in which a cauldron of boiling, highly-flavored stock is placed on the table. Then lots and lots of raw food items are brought out along with various dipping sauces and you get to dip your selections into the stock and sort of design your own meal. 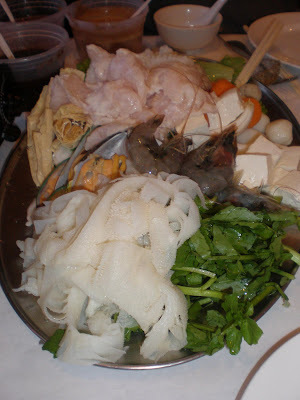 Sort of like the Szechuan version of fondue. Greens, shrimp, squid, tripe, tofu, tofu skins, fish filets, squid balls, fish balls, mussels and bok choy. Here is the cauldron with two types of tasty stuff boiling away. Not pictured is a platter of sliced beef and lamb. It arrived much later for some unknown reason. Our friend, Ken, is a fan of tropical fruits and he had just received a shipment of caimitos and cherimoyas from California which he very graciously shared with us. What is a caimito you ask? 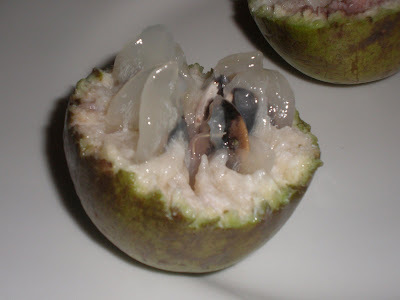 What is a cherimoya? I hear you say. 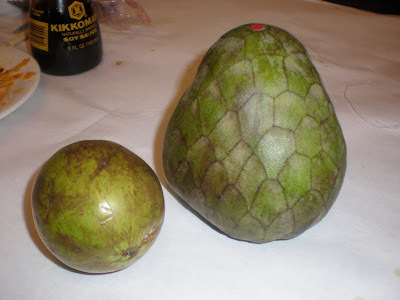 Here is a photo of a caimito (the little fruit) and the cherimoya. Mark Twain once wrote that a cherimoya is “the most delicious fruit known to men.” I might have to agree with him. It has a white, custard-like flesh that tastes like a combination of bananas, pineapples and strawberries with a very perfumey sensation. I loved it and will buy one whenever I see them. The little caimito, on the other hand, had a very subtle taste sort of like rose water. However, once cut open, it looked pretty scary. Afterward, we had our usual durian fruit smoothies. I even asked the server if I could taste a piece of pure durian fruit and I have to say that it was so unbelievably vile, it made me laugh uncontrollably. Tripe, squid balls, caimitos, cherimoyas and durian. I’ve been in the same apartment for four years now and it’s definitely been the most favorite place I’ve ever lived. That is, until the problem arose with my neighbor last year. She’s become a binge-smoker and her acrid, stale cigarette smoke makes its way into my apartment though the ventilation system that we both share. It’s gone on for over a year now and all attempts at remedying the situation have proven fruitless. So, I’m moving. Like I said, I love my apartment, especially the view. I’ll have a very nice view in my new apartment, but it won’t be the same. I got to thinking about the pros and cons of moving to a different place. 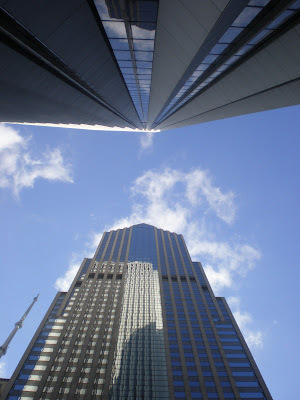 Mind you, I’m only moving from the west tower of Marina Towers to the east one; and from the 49th floor to the 50th. As I noted all the positives, there was one I forgot. . .
. . . I won’t have to deal with this one particular doorman anymore. He’s there every day when I come home from work and he’s ever-so friendly. Too friendly. I can’t seem to get into the elevator without him launching into his “banter mode” as I call it. Oh my goodness! I just don’t know how to respond to such a barrage of greetings. A simple nod on his part would suffice. Really. I really am a friendly guy, but after a long day at work I'd really prefer not having to respond to such an enthusiastic onslaught. I’ve also thought about being a total snurd and telling the guy that I suffer from an acute form of “social anthrophobia” (fear of people) and would really appreciate it if he could just quietly let me in the door whenever I come in. But I didn’t. His intentions really are in the right place. As a matter of fact, Miss Healthypants seems to like the guy. So, after I plunked down my security deposit, I told Mister Mouth that I would be moving into the East Tower. (I have to admit, I enjoyed informing him of that). On my way to work each day, I pass by this little street that has, apparently, been the target of excessive honorary names in the past. This street (Beaubien Court) is just a one-block long side street, yet it has been festooned with signs that give homage to past dignitaries. I’ve seen these “honorary” street names all over Chicago. I don’t know the purpose in doing that other than someone gets to see their name on a counterfeit street sign. I’ve yet to see a street such as Beaubien Court that has had, not one, but two other street names slapped on it. One is Hon. Allen Hartman and the other is Canada Place. Both were honored at the same time, back in 2006. So, one of this street's names is actually "Honorary Hon. 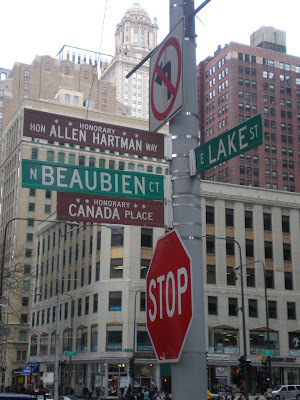 Allen Hartman Way". That's an awful lot of honor. Here’s what I wonder about. . . . If this street is given two honorary street names, does that dilute the honor of each name by half? Since one of the names has "honorary" in it twice -- is that the justification city officials used for diluting the honor by half? Like I said, I pass by this street twice a day, so I often ponder this stuff. I think if I was the Hartman family, I’d be pretty insulted by having the shortest street in all of Chicago named after my family member. Not only that, his honor was instantly lessened by fifty percent.